Pork is one of the leaner and healthier meats and it's full of flavour. The recipes below use bacon, sausages, tenderloin and lots more pork based ingredients. Click any description below to be taken to the full recipe all of which have been tested to destruction! 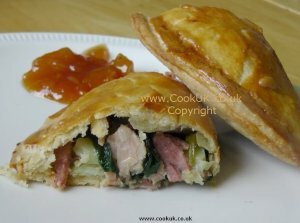 Pork, apple, new potatoes, onions and some well-chosen seasoning make this a slightly unusual pasty which has lots of delicious flavours. 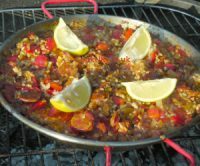 Traditional paella rice and vegetables combined with not so traditional pork and chorizo for a delicious paella. A dish with spectacular colour, it tastes even better. Easy to cook. There is no better way to start the day! 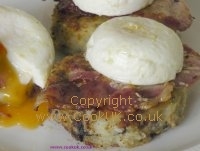 Black pudding potato cakes topped with a slice of bacon and a poached egg. Our pictures and video guide you effortlessly through the preparation and cooking. One half of a filled red pepper makes a good light lunch, two halves make a good main meal. Delicious. 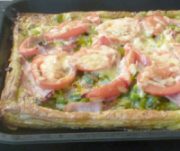 A simple recipe if you follow our instructions and use a savoury pastry case. Great for sunny days with a salad. Very best American Meatloaf Recipe. Delicious for lunch, dinner and superb for a hearty breakfast. Use good quality lean minced pork for these extremely flavoursome sausages for your barbeque. Add some crisp, fresh salad for a tasty summer meal. A spectacularly simple recipe with spectacular results. 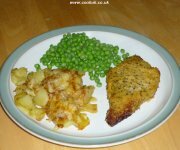 It's simply pork tenderloins, drizzled with olive oil and coated with a bread crumb and herb mixture. We were amazed by how tasty it was and how professional it looked. One of life's culinary delights, ham, egg and chips are a treat when cooked properly and with top quality ingredients. Very easy to cook, super tasty to eat and it looks the part as well. 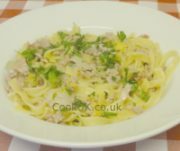 A superb tagliatelle recipe which is well worth a try. Use good quality pork sausages for this recipe and you have superb British meal. A lighter than normal pasty, great for the summer or winter. Eat them hot or cold and they can even be "microwaved" from the fridge. Pork mixed with sage and onion stuffing wrapped in bacon. This makes a great meatloaf served with cranberry sauce. Cassoulet is a classic French stew made with preserved meat. In this version we have used pork sausages and bacon. Tasty pork with pineapple cooked in the oven or slow-cooker at a low temperature. A traditional snack at Christmas, sausage rolls are a great treat at any time of the year. 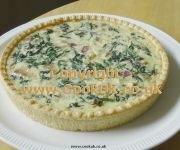 The sausage meat is cooked in a casing of short crust pastry. 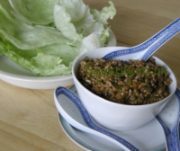 This is a more traditional recipe compared to the mono sodium glutomate loaded ones from your local takeaway. They also taste 10 times better! A heart warming family meal that will feed four for less than a fiver. But it's not just cheap, it's really tasty and attractive. Easy to cook as well, this is a delicious dish for any occasion.